An unusual World War II Era China Trade decorative fan and view of Canton or Guangzhou. An unusual discovery, this is a chromolithograph fan illustrating the Foreign Trade Zone in Canton, or Guangzhou, China. The illustration, printed with rich blues and yellows, illustrates the waterfront and harbor, including numerous ships and barges afloat, in the early 1850s. Flags illustrate those nations who maintained a trade presence in the region, including the United States, England, France, and Switzerland, among others. This map would have been made late in the history of Canton's foreign trade zone, which was originally instituted in 1757 as a system by which isolationist China could control foreign trade. The system declined after the 1842 Treaty of Nanking, in which additional trade ports, including Shanghai, Nanking, Xiamen (Amoy), Ningbo, and Fuzhou were also opened. By 1866 most of the China trade relocated to other more favorable ports. This curious fan is undated, but must have been issued around 1938 or 1939 shortly after the 'Japanese Fan Company' changed its name to 'The Fan Company.' The fan's focus on China and specifically Canton is a clear marketing strategy to distance itself from Japan and Japanese goods. The verso of the fan features promotional text advertising the firm. Although it is unclear, this fan was most likely printed in New York. The Fan Company (fl. 1878 - c. 1940), formally known as the Japanese Fan Company, was an importer of Chinese and Japanese trade goods active from 1876 to the 1940s. 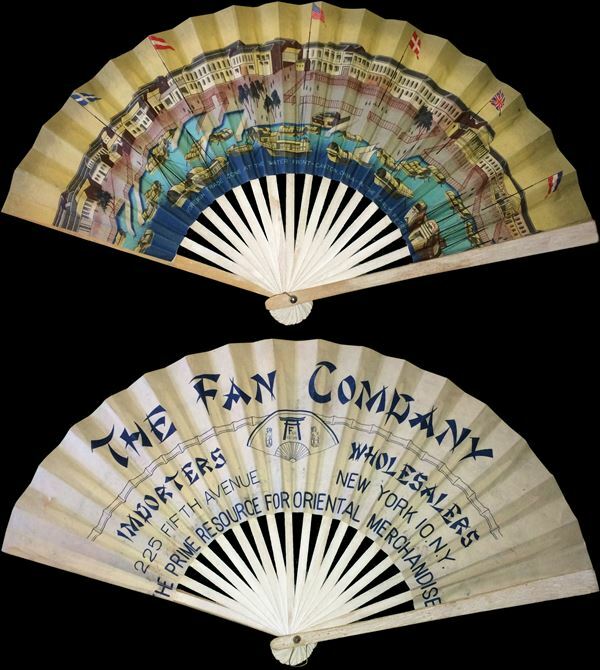 In 1838, the firm changed its name to the "The Fan Company" in a response to World War II era anti-Japanese sentiment.